This week I’m working on a series of four winged cats. I haven’t really decided if they’re cat angels, super-hero cats, or a half-remembered scene out of the Wizard of Oz. But I do know I’m having a lot of fun making them. Two of my very non-angelic cats posed for me. Their modeling fees were paid with tuna fish. All these cats will be transported to Bellingham for an after-Thanksgiving art show. Hi Joanne. I didn’t take any pictures of the process, for some reason. I think I was in a hurry, trying to build lots of cats for show that ended up being cancelled. Maybe I’ll do another one some day. OH MY GOODNESS . 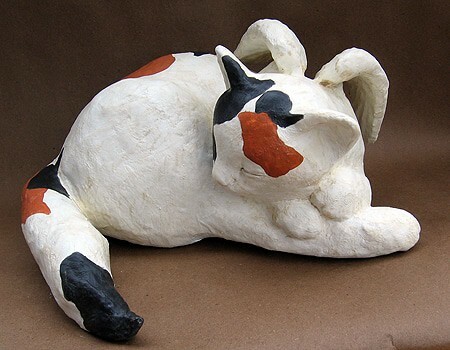 paper mache is a beautiful art!!!!!! i thought nothing of it until i found this site!!!! this is beautiful im going to get started making some sculptures!!!! can u make a grown male lion? Are you looking for instructions about how to make one yourself? When I do mine I’ll be making a cardboard pattern and building a form with crumpled paper and masking tape, just like I did with the paper mache panda. If you get your lion done before I do, I hope you’ll let us see him. jonni how do we purchase work done by you? What a nice thing to ask! You can find the sculptures currently available on my gallery page. (Click the “Available Sculptures” tab at the top of the page). Special commissions may be considered. If you have something in mind that you don’t see here, please contact me directly. (remember to put “paper mache” in the subject line, so your email won’t get lost among the hundreds of spam emails I receive every day). I am in the middle of writing a book, so the number of commissions I can accept is limited. On a completely irrelevant note, I recently learned where the original idea of winged cats came from. Back in the middle ages, when superstition and anti-cat sentiment was running high, certain days were set aside for torturing these innocent creatures. Evidently, people forgot the service cats perform by ridding towns and barns of rodents, and cats were associated with older women who had knowledge of herbal remedies. “Witches,” in other words. As a part of the anti-cat celebration, some cats would be flung from the town’s belfry, and a surprising number of them survived — “proving” that they were diabolical. So, the first paintings of winged cats did not represent cat angels, but cat demons. But my cats are angels – and I’m sure all those “flying” cats back in the middle ages were really angels, too. The people were just too ignorant to know it. anyways have pleasent time.. and keep inspiring us.. I just love your work and this great site you have created, Thank you, Thank you, Thank you. These remind me of a favorite childresn book “Catwings” by Ursula LeGuin. OOh – I’ll have to read that. I enjoy reading children’s books, and LeGuin is one of my favorite authors. I don’t know how I missed it. Thanks for the tip. Oh boy! I can’t wait to see them in person, Jonni! I love them both, and am really enjoying the curled up Calico. Can’t wait to see the lions! 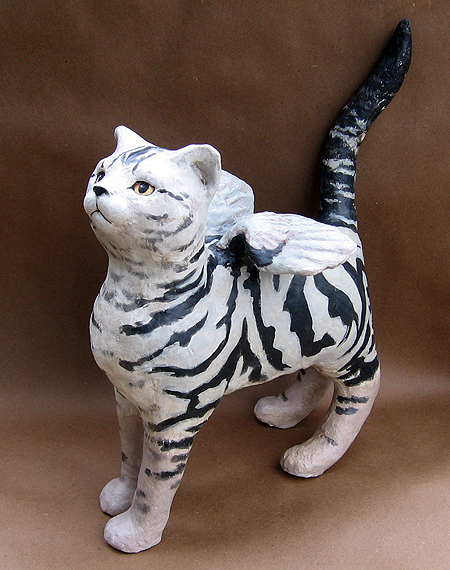 You have captured the life force in this Grey Striped Angel Cat piece. The pose, form and facial expression are so dynamic! I half expect this Angel Cat to fly off or at least sprint way suddenly. Gosh – thanks for the nice comments, everyone.